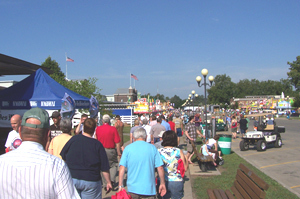 Folks who’re heading to the Iowa State Fair are being reminded to practice good hygiene. The big event typically draws about a million people and many thousands of animals during its 11-day run, presenting an untold number of opportunities for passing infections. Dr. Ann Garvey, a public health veterinarian at the state health department, says wise state fairgoers will remember a few key lessons. "Not only for the safety and health of the animals but also for other visitors," Garvey says. "We’re asking people to make sure you’re washing your hands often, you’re covering your coughs and sneezes and if you’re ill, please don’t go to the fair." Garvey says the H1N1 influenza still a concern, too. "People have passed novel influenza A H1N1 to pigs in other countries but that has not occurred in the U.S. and we haven’t found the virus in any of our pigs in the U.S.," Garvey says. "There have not been any reports of pigs passing it back to people. We’ve gone from people to pigs, but not vice versa." As for eating those popular pork chops on a stick while strolling down the midway, Garvey says to dig in. "You cannot get novel influenza A H1N1 from eating pork or pork products," Garvey says. "Eating properly handled or cooked pork products is very safe." For more information, visit the Iowa Department of Public Health website .